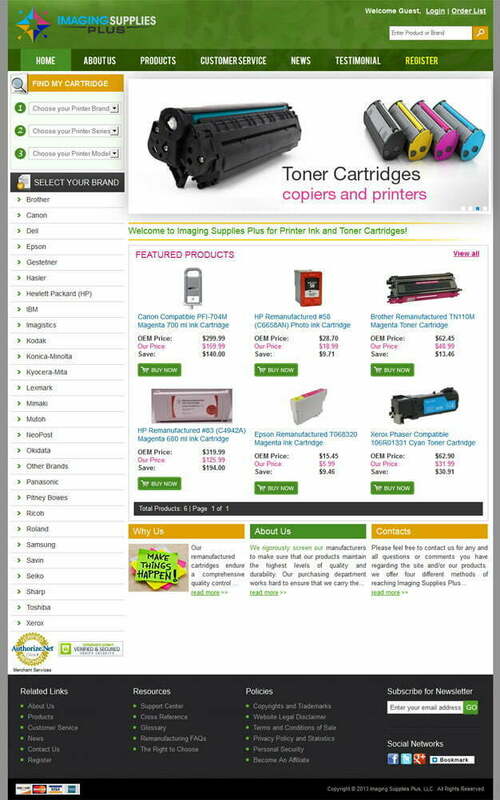 Imaging Supplies Plus provides industry-leading ink solutions for a full range of printer cartridges, ink, inkjet refill kits, laser toner, fax toner and countless other printer supplies while ensuring the highest performance and quality standard possible. Instead of adding to the global waste that comes from commercial office supplies and newly manufactured cartridges, Imaging Supplies Plus offers a cost-effective alternative by remanufacturing cartridges to replace your original printer cartridges. Our remanufactured cartridges, made in the United States of America, endure a comprehensive quality control process including documented disassembly, cleaning, filling, component replacement and quality testing. Each cartridge is specifically engineered to increase the performance and quantity of pages per fill so that you receive optimal service. Special rates and staff support options are available to Government and Education IT. The need was for a website thats easy to use for the general internet user and powerful enough for a advanced professional printing company, the core idea was that the user should be able to get to the ink of his choice within 3 clicks. The backend system had its own challenges with custom integration with ERP systems for order processing and business reporting. Pulse Solutions delivered a system thats easy to use, meets the 3 click to an ink requirement with all the powerful backend management tools as necessary for seamless buinsess operation.